When you think about the month of march, what comes to mind? You got it! St. Patricks Day! So it only seemed fitting that I design my month around this special holiday. 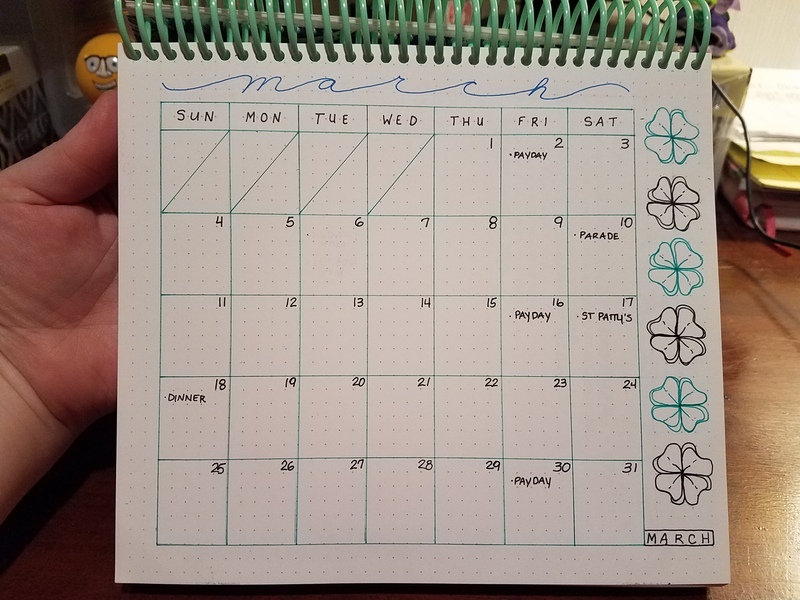 I know it is already the middle of the month and I am a little bit behind, but in my defense, I didn’t get my notebook until around the 2nd of March. Anyways, I hopw you enjoy what I have to offer this month. The first thing is always the title page, Look above! The next obvious choice is the monthly calendar. I decided to just do this one as simple as possible. I might get more bold later, but for now, lets just be happy its done. I had this idea that I would like to see what things had the most affect on my moods. That is when I came up with this two page tracker spread that tracks my period, sleep, weather, exercise, and mood. This way I can see, every day that the weather was this, my mood was that, or whatever it was that was affecting me the most. The line a day, also helps me put in one major event for that day and that will also help me out. This month we have a parade and an after-parade BBQ we were hosting. This causes stress but seeing how the other things work in with that is what I think is interesting. This may be the only month I do this, but I thought I would attempt it anyways. 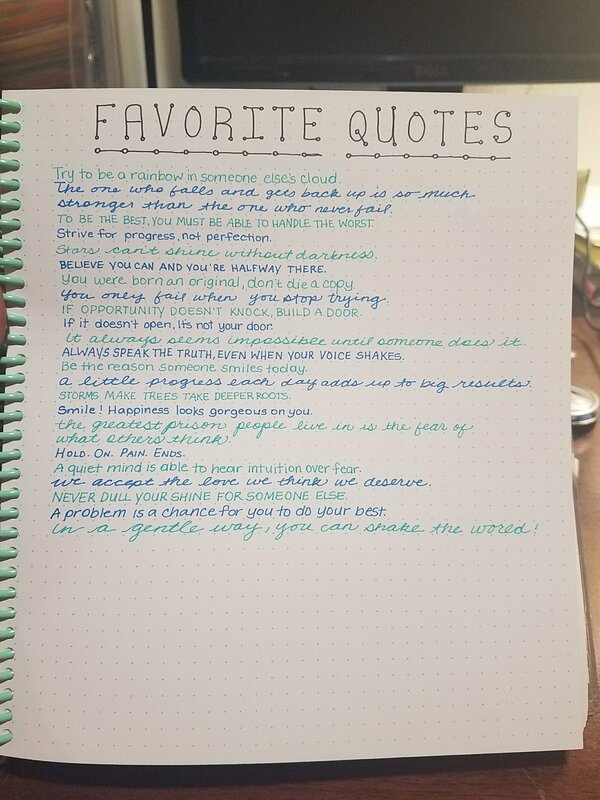 The next step in my monthly journal is to keep a collection of my favorite quotes for that month. So as I go through life and see something that makes me say, “hmmm” I write it down. No fancy faux-lligraphy here, just my normal handwriting. I decided that besides alternating colors, I would also alternate font. There are three ways that I write consistently, all caps, normal print, and cursive. The next item I wanted to track were my dreams. I am known for my vivid dreams. Even though this layout only gives me two lines for each dream, I write them in more detail on my phone memos when I first wake up, so I just want a place where I can put a snippet in. The most interesting thing about the dream. Then, I can flip back to the weather and events of the day to see if anything is having an affect on the types of dreams that I have. This may be way more in depth than some of you want to go, but this is all an experiment. I think that you should experiment with the different trackers you do until you find what works best for your schedule. Remember that a bullet journal is not a chore, its a life-line. 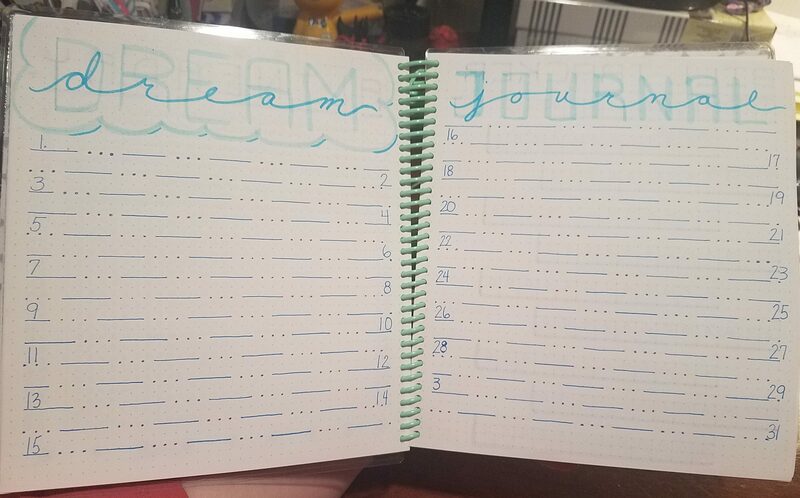 Use your bullet journal any way you want to and in the style you want to. There are a lot of overwhelmingly amazing spreads on pinterest, but if you constantly compare your skill level to theirs you won’t follow through with the journal. I would like to make a comment about the fact that you don’t see any weekly spreads from me. Weekly spreads are something that I will hopefully add in the future, but for now, I find it overwhelming. If you have any comments or suggestions about things you would like to see me track in the future, don’t hesitate to comment below and let me know what you want to see.